This exercise is to be done with a support like a machine or a squat rack. Incline your chest forward and with your arm stretched, grab a stable support. To increase the stretch of the latissimus dorsi and teres major, you can rotate your chest trying to put on the top the lower shoulder slowly. This exercise is excellent to do before back’s exercises surch as heavy pull (lat pulldowns) or chin-ups with weights. 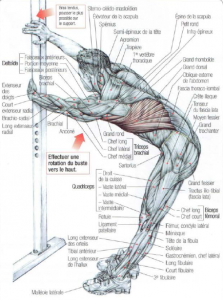 This allows you to avoid tearing latissimus dorsi and teres major.